Provide access, windows and platforms, training & skill development, awareness and advocacy, group mobilization, and ensuring entitlements gained by beneficiaries from the information services received. These activities are key interventions in this phase to achieve maximum outputs and outcomes during project period. Wherein, it is required to cover such schemes which are already alive in the respective area in some way or the other and people are aware of. For example NREGA and NRHM are the 2 schemes which are the most prominent in almost all the state. 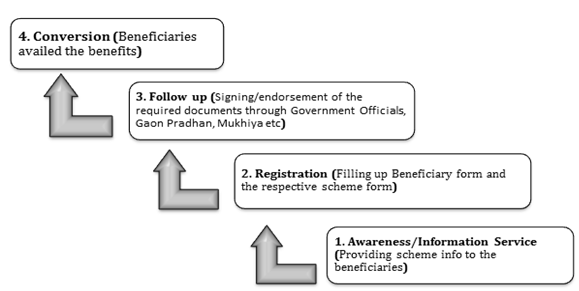 Annexure 3 can be addressed to see all the available schemes to start the delivery work in phase I. The team has to work for all other schemes phase wise with the priority to the core areas of Education, Health, Financial Inclusion, Employment, Livelihood and Social Security. The execution can be classified into stages as per the criteria of availing any Scheme.